This is it: The ideal antidote to these trying times. Slim’s wit, style, charm, and grace will make the world vout oroonee in no time. As with all Proper Boxes, this one includes 4 CDs packed to the limit (102 tracks total!) for over 5 hours of music -- all remastered in the UK at the highest possible standards for music recorded during this period -- and a 44 page booklet containing a comprehensive history of Slim's career along with fab photos, old ads, record labels, and, best of all, complete track by track annotation -- where you’ll note the appearances of Slam Stewart, Ben Webster, Zutty Singleton, Dizzy Gillespie & Charlie Parker among many others -- along with a bountiful biographical career history by the all-knowing Joop Visser. All this for the copacetic price of only $29.75! How!?!?! Guitarist, pianist, vibraphonist, linguist, bongo player, tap dancer, cook, tombonist, saxophonist, actor, singer and surrealist, Slim Gaillard was all this and more. A one of a kind renaissance man. 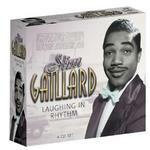 This 4CD set follws Slim's musical adventures from 1938 until 1952. Crazy? Hilarious? Subversive? It's all that, but above all it's Oreenee. TEMPORARILY out of stock – more already on the way, please check back. Slim and Slam : Slim Gaillard, g, vib, voc; Slam Stewart, b.voc, acc by Sam Allen, p; Pompey "Guts" Dobson, d.
Slim And Slam : Slim Gaillard, g, voc; Slam Stewart, b; voc, acc by Kenneth Hollon, ts; Sam Allen, p; Pompey "Guts" Dobson, d.
Slim Gaillard and his Flat Foot Floogie Boys : Loumell Morgan, p; Slim Gaillard, g, voc; Slam Stewart, b; Hubert Pettaway, d.
Henry Goodwin, tp; Garvin Bushell, cl; Loumell Morgan, p; Slim Gaillard, g; vib (-1), voc; Slam Stewart, b; Hubert Pettaway, d.
Henry Goodwin, tp; Garvin Bushell, cl; Kenneth Hollon, ts (-1); Loumell Morgan, p; Slim Gaillard, g, voc; Nick Fenton, b; Hubert Pettaway, d.
Slim Gaillard and his Flat Foot Floogie Boys : featuring Slam Stewart, Loumell Morgan, p; Slim Gaillard, g, voc; Slam Stewart, b; Kenny Clarke, d.
Slim Gaillard & his Flat Foot Floogie Boys : Ben Webster, ts; Jimmy Rowles, p; Slim Gaillard, g, voc; Slam Stewart, b, voc; Leo Watson, d.
Slim Gaillard and his Boogiereeneers : Slim Gaillard, p, voc; Fletcher Smith, p; harpsichord or "doctored" piano (-1); Tiny "Bam" Brown, b. Slim Gaillard Quartet : Dodo Marmarosa, p; Slim Gaillard, g, p (-1), voc; Bam Brown, b; voc; Zutty Singleton, d.
Slim Gaillard Quartette : Dodo Marmarosa, p; Slim Gaillard, g, novachord (-1), voc; Bam Brown, b, voc; Zutty Singleton,d. Dizzy Gillespie, tp; Charlie Parker, as; Jack McVea, ts; Dodo Marmarosa, p; Slim Gaillard, g, p (-1), voc; Bam Brown, b; Zutty Singleton, d.
Slim Gaillard and his Trio : Wini Beatty, g, voc; Slim Gaillard, g, voc; Bam Brown, b; Zutty Singleton, d.
Slim Gaillard Trio : probably Dodo Marmarosa, p; Slim Gaillard, g, voc; Bam Brown, b, voc. Slim Gaillard and his Trio : Unknown, p; Slim Gaillard, p, voc; Bam Brown, b, voc; Jim Hawthorne, barks. Slim Gaillard Trio : Unknown, p; Slim Gaillard, g, voc; Bam Brown, b, d, voc. Slim Gaillard and his Musical Aggregation, whenever he maybe : Slim Gaillard, g, voc, with unknown Orchestra. Slim Gaillard and his Shintoists : Ben Webster, ts; Cyril Hayes, p; Slim Gaillard, g, voc; Ray Brown, b; Milt Jackson, d.